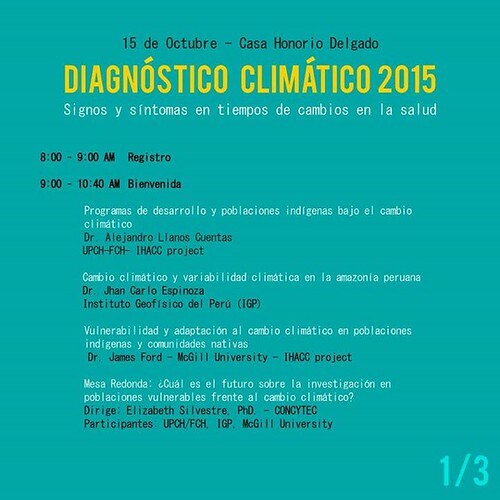 Last week, the IHACC Peru team hosted a two day seminar called Diagnóstico Climático 2015 at the UPCH Miraflores campus. The event sought to create a space for interaction, discussion and learning to describe and assess the relationship between climate change and health. The seminar specifically focused on climate change and climate variability and the health of indigenous and rural communities. The event included a variety of presentations and roundtable discussions with participation by public and private actors from local, regional, national, and international levels. The event was attended by >50 people including high level representatives from the Ministry of Health and Ministry of Environment. IHACC team members Dr. Alejandro Llanos-Cuentas, Dr. César Cárcamo, Jahir Anicama Diaz, Dr. James Ford, Dr. Sherilee Harper, and Mya Sherman presented on both days of the event.